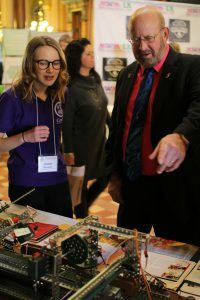 Senator Rich Taylor learning from a student during a STEM Day at the State Capitol. STEM education programs are vital in expanding the skilled workforce in Iowa. Iowa’s shortage of skilled workers has been our biggest obstacle to economic growth. Investing in education and job training can change that. Good education and worker training lead to better-paying, high-quality jobs, and a skilled, well-educated workforce in turn draws good businesses to Iowa. While Iowa has the highest high school graduation rate in the country — with almost 92 percent of students earning their diploma on time– only 27 percent of Iowa adults have a bachelor’s degree or higher. By 2025, 68 percent of jobs in Iowa will require some education or training beyond high school, but not a bachelor’s degree. That’s where we’re targeting Iowa’s worker training efforts. Investing in apprenticeship training and job retraining at our community colleges. Increasing the number of skilled workers with affordable tuition and other community college investments. Ensuring high-quality workforce training by boosting opportunities for Career Technical Education (CTE) in Iowa high schools. Improving the classroom experience for our K-12 students with a Teacher Leadership initiative. This program allows Iowa’s most effective educators to work with new teachers and to mentor those looking to improve. Ensuring access to initiatives and internships for students studying science, technology, engineering and math. A recent evaluation of Iowa’s STEM efforts shows that students in high-quality STEM education programs score higher on Iowa Assessments in mathematics, science and reading, and that 90 percent of Iowans think STEM education should be a priority. By making STEM a priority, Iowa now has more students taking Advanced Placement STEM courses, more teachers earning STEM endorsements and more students hoping to earn a STEM degree compared to five years ago.